Creative branded items that people use with on a daily basis are becoming increasingly hard to find. This must be why carabiners remain so popular in the promotional products industry. We offer carabiners in a multitude of different shapes and styles. 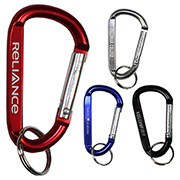 Our most basic carabiners are a stylish item that can be customized using your client’s logo. At Innovation we pride ourselves on offering different printing options. 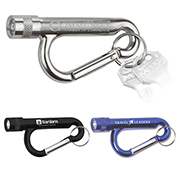 These carabiners are a great budget product that can take a one-color imprint or laser engraving. Carabiners including our ever-popular CA1 come with a complementary split key ring. We also offer many different retractable badge reels with carabiner style clips. Some of our retractable badge reels can be decorated using our proprietary PhotoImage® four-color process printing. 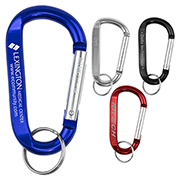 Many of our promotional products include a free carabiner in the price. Some examples of these sought-after products are hand sanitizers and key lights. These carabiners can attach to nearly anything and ensure that these items will be used for quite some time.